Who’s the most serene person you've ever met? A pipe smoker? A pipe smoking gardener? A pipe smoking gardening vicar? Well, thanks to The Chap, you can begin your three-stage path to serenity. They now have their own pipe tobacco blend - Brown Study. Blended in England, Brown Study is named after the term used for a state of deep reverie. Indeed, Dr Watson falls into a brown study in the Sherlock Holmes story The Adventure of The Cardboard Box. "Finding that Holmes was too absorbed for conversation I had tossed aside the barren paper, and leaning back in my chair I fell into a brown study." 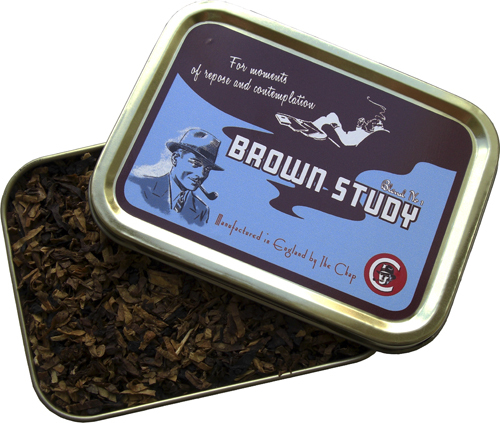 In The Chap's words, the Brown Study blend is "an aromatic tobacco with hints of citrus, peach, plum, raisin and vanilla, with a room note that can best be described as toasted tea cakes and profound thoughts." A nice blend to enjoy when trimming your privet hedge or working on your sermon, perhaps. Pipe smokers of old may equate brown study as akin to a Condor moment.